This is our Fruit Varieties website. To visit our main pages click here or choose Main GOT site. A cut in tax and growth in sugar production in the colonies resulted in Britain in the 1850/60s having probably the cheapest sugar in the World. 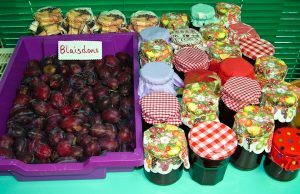 This encouraged the production of jam, the Blaisdon Red, and Yellow Egg plum found in woods and hedges in the Severn Vale met this demand. Stones from Prunus avium (sweet cherry) and P. cerasus (sour cherry) were found in Nympsfield Long Barrow. Heritage collections of plums, cherries and damsons are being planted in GOT’s Longney orchards to ensure these old varieties saved for future generations. 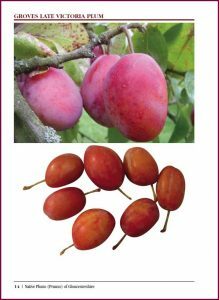 Heg Peg Dump was a popular dish in Gloucestershire, made with suet and plums/damsons and served on St Margaret’s Day (20th July). Charles Martell’s book Native Plums of Gloucestershire was published in spring 2018. It describes the stone fruit of Gloucestershire, discusses what is meant by the names plum, bullace, pruin and damson and when and how they arrived in our countryside and considers the Shadow Orchard and the emergence of fruit into the managed orchard. It complements our other books (also by Charles) on Gloucestershire’s Apples and Pears. Details of all these are available on the bookshop page of our main website. Looking for our main website? For details of these and how to buy them visit our shop page.